Please Download "Ouick install Guide" from product detail page if you don't know how to use it. 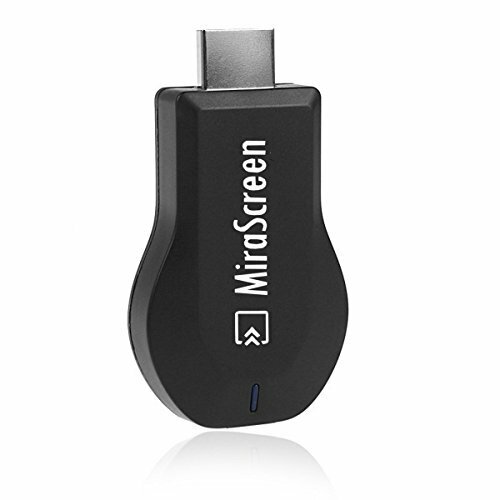 Step 1: Connect WiFi cable (micro USB head) to MiraScreen dongle. Step 2: Plug the MiraScreen dongle into the HDMI port of your TV and switch to the right input source. Step 3: Plug USB cable into TV USB port or an external USB power adapter (5V/1A). Step 4: Display MiraScreen Main Page. Step 3: Establish WiFi connection between iOS device and MiraScreen. Step 4: Turn on Airplay and select MiraScreen's SSID. Then start mirroring. Step 3: Find the Miracast function on your Android device (such as screen mirroring/Miracast/smart view). 【3 Steps Easy to Setup 】Step 1: Connect WiFi cable (micro USB head) to MiraScreen dongle. Step 2: Plug the MiraScreen dongle into the HDMI port of your TV or projector and switch to the right input source.Step 3: Plug USB cable into an external USB power adapter or TV USB port. No need to install any driver and APP, for detailed operation, please see "Ouick install Guide" PDF file in technical specification. 【Reliable Quality】Miracast Dongle support HDMI 1920x1080P full HD output. With OTA chip, support upgrade online. Mini, small-size, lightweight, convenient for travel. 【Lifetime Guarantee 】If any quality problem, please contact us and our support team will reply within 24 hours for any technical support. So if you have any problem, send us an email the first time, will support you the best. If you have any questions about this product by Wristel, contact us by completing and submitting the form below. If you are looking for a specif part number, please include it with your message.